The wonderful thing about being at a writing retreat set in a hunting lodge in the middle of the woods is… well, almost everything. There’s great company, time and space to write, conversations that fuel creativity, discussion that challenge and stretch, and beaucoup laughter. The downside of being at a writing retreat set at a hunting lodge in the middle of the woods was missing the Schmidlets. And, that every time someone entered my SWEET Giveaway, I had a new candy craving and no way to satisfy it. · Whoppers & Bottle Caps! I hadn’t thought about them in years. · Twix! I used to try and convince my mother those weren’t candy, but a form of granola bar. · Milk Duds! Delicious and a handy way to tear out fillings. · Licorice! I always bite the ends off Twizzlers & use them as a straw. Tasty & functional. · M&M’s are clearly the chocolate version of Revision Skittles – Wasabi peas are the healthy version. · Peanut Butter Cups! I recently heard that these can be used to make S’mores – have any of you tried this? I need to ASAP. · Kit Kat, Almond Joy and Heath lovers – I challenge you to try S’mores with your candies of choice too – make sure to report back to me with your results. · And gummy-lovers (both sour and not), you people are my tribe. Let’s all get together and ruin our teeth with chewy deliciousness. Initially I had big fancy-pants plans about how I would choose a winner – writing all the numbers on gumballs and then filming the winning one coming out of the gumball machine. But we don’t have a gumball machine, I’m still in my pajamas, and am quite busy making up four days of Schmidtlet-snuggles. 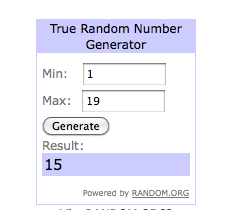 So, I defaulted to a random number generator. Without further ado – the winner is: Loralie! Rock your Revision Skittle Boombox with pride – I highly encourage recreations of the scene from Say Anything. Thanks, everyone, for entering and stay sweet!